With Contributions From David Smail and From Vera Haydock. ​It was a lovely coincidence that I received information from two quite separate sources, which referred to the same cowkeeping address in Liverpool. David Smail’s research into the Taylor branch of his family tree has thrown up some unusual anecdotes, whilst amongst her family records, Vera Haydock discovered a newspaper clipping about a 14-year-old Milk Girl. Both of these refer to a dairy business based at 3 Church Road - in the Aigburth district of Liverpool – and together give a fascinating glimpse into the cowkeeping way of life in early-1900s Liverpool. Richard Taylor (b. 1874) was one of nine children of John and Margaret (nee Barnes). The family farm, called Thorphinsty Hall, was 400 acres near Cartmel Fell - located in what was then, northern Lancashire. When John took the tenancy at Thorphinsty he had to borrow from his father-in-law, Anthony Barnes. Anthony was well known and respected as a breeder of Shorthorn cattle. John benefited from his advice and kindness and, no doubt, his bull. There was some good arable land at Thorphinsty, so crops of barley, oats and wheat were grown. John's uncle, Tom, was a corn merchant in Kendal so had no trouble selling his produce. John was lucky to be farming at that time, when mowing machines and steam driven threshing machines became available. Turnips were grown for winter-feed for the cattle. It was very labour intensive, but with nine children he had the manpower. The girls milked the cows and made it into butter. The men did the mucking out and worked mostly in the fields. Sometimes, Richard and the rest of the boys were given the job of taking cattle to Milnthorpe Station, where there was a weekly market; the cattle left on a train after the sale. The boys drove the cattle along the roads for the ten-mile journey. Father John told them how much they had to make and if they didn't make the price they had to bring the cows back again. In 1902, in Kendal, Richard married Jane Scott (of Witherslack) and they began their married life together at a small farm called The Ashes. They had five children in four years, one son and four daughters. As the farm was not big enough to support them all, Richard looked out for opportunities elsewhere. Someone told him of the life of a cow keeper. There were a lot of them in the various towns and cities of Northern England, many of whom originally came from Westmorland. So, in 1907, Richard went to Liverpool and made a purchase. It seemed a risky venture to his wife, Jane, and her family, but the deal was done and they set off for the big City. They moved into a property at 3 CHURCH ROAD, St Michael’s, in the Aigburth district of Liverpool. This was not a farm but a purpose built Dairy; there was a yard and shippon to the rear, but no fields for the cows. The property had previously been owned by JAMES HANSON, cowkeeper (1901). Workers in Dairy: Thomas Kinnear (29) from Hesket, Cumberland; Richard William Todd (41) from Walton, Yorks; and Thomas Peers (32) from Liverpool. Also present at the time of that census were: Frederick Scott (32), Richard’s brother-in-law and a ‘farmer’s son’, from Witherslack, Westmorland; and, Mary Jane Polhill (18), a servant from Toxteth, Liverpool. Mary Irving, of Sedgwick, has been researching her family history and came across a series of picture postcards, who were a favourite communication in 1900s. From them she has gleaned some idea of the life of her mother, who was a teenager at that time. Much is written about teenagers today, which set me thinking about the life of a young person about 100 years ago. The word teenager had not even been invented then. My mother, Isabel Stewardson, known as Bell, was born in Witherslack on November 1, 1893, the fourth child in a family of nine. From a small collection of old picture postcards sent by sisters and friends to her at various locations, I have been able to get some idea of what her life was like. The oldest postcard dated 1906 is a card of condolence at the very sad death of a younger sister, aged 10, from meningitis. By 1907 and early 1908, she was in service working on a farm, High Steneerley, near Lowick in the Coniston area. As she was not 14 years old until November 1907 it is possible she was hired at the Hiring fair at Martinmas on November 11. She would be classed as a servant girl. Recent statistics released in the 1911 census show that one in every seven of working people at that time was classed as a servant. Her work would have included all the aspects of cleaning in the house and, on a farm, dairy work and possibly work in the fields. 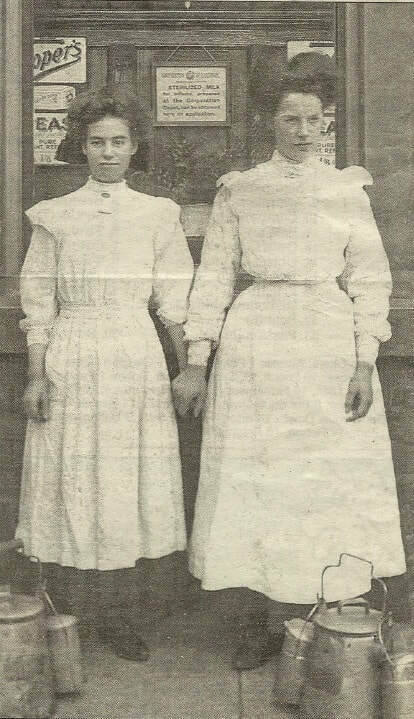 By July 1908 she was at Rawson’s farm in the Lyth Valley, back near her home. The farmer at that time was called Scott and here Bell received a card saying ‘glad you like’ suggesting she was happy with this move. There was a lighter side to life with references to dances and going to church on Sunday evenings. Bell’s next move was to a milkhouse in Liverpool, c/o a Mrs Taylor, 3 Church Road, St Michaels, Aigburth. This photograph was taken outside this address. Bell is the taller of the two girls. Bell’s move at this time reflected a trend when many people moved from the north to run or work in dairies, which sold fresh milk to townspeople. By about 1911, Bell had left Liverpool and was back in Westmorland. The illness of her mother may have been the reason for her returning. Sadly, her mother died in 1911, aged 51, when Bell was only 17, and she later told her children this had been a very great loss. Bell next worked for a Mrs Bell at Low Greenrigs, Underbarrow, where she seems to have stayed until her marriage, aged 19, in 1913. She went on to have eight children, all of whom survived well into adulthood. Her teenage years had given her a very good training to be a farmer’s wife. 3 Church Road, St Michael’s, Aigburth. The Taylor sisters were happy at the dairy in Aigburth, until the arrival of their big brother, Eddie. The problem was that Eddie had spent a long time with his uncles, doing the gruesome things that farmers sometimes have to do. But, what he thought was funny, his sisters thought horrific. This problem resolved itself, as their new home was not really a farm, and so there was very little demand for Eddie’s skills. School holidays saw an exodus of the girls back to Cartmel Fell. The train from Liverpool took them to Lancaster, then another to Grange-over-Sands. Uncle William met them from the station and they were soon at Thorphinsty. A lot of the Liverpool Cowkeepers were from the South Lakes area so there was an atmosphere of camaraderie when they met up. This led to the formation of an official organisation - The Liverpool Cowkeepers Association. The association’s social life tended to revolve around public houses, much to Richard’s satisfaction - as he enjoyed a pint or two. However, Jane and her fellow cow-wives were excluded from this social activity and were none too pleased about it. In response to this growing disquiet, the men realised they must do something to appease their womenfolk. They came up with the idea of taking their wives on a trip to Switzerland. The ladies liked the idea and were soon enrolling for the trip. As the time for the holiday drew near the numbers increased. Posters were put up in Switzerland to promote the important event and Swiss residents were keen to see how many of these English visitors would arrive. When the time came, the trip was fully booked. As the cowkeepers and their wives arrived in Switzerland on the train they were amazed at the number of people gathered at the station to greet them. The cowkeepers found themselves surrounded by enthusiastic residents. It turned out that there had been a mistake in the translation; the posters that had been put up to advertise the cowkeepers arrival had been worded to welcome – COWBOYS! Otterspool Farm, St Anne’s, Aigburth. The Taylors' business prospered and word spread around the extended family. Jane's brother, Fred Scot, fancied doing the same and he went down to Liverpool. Nothing was available, so he returned north, leaving instructions for Richard to look out for an opportunity. This led to Richard discovering OTTERSPOOL FARM, located behind St Anne’s Church, just a mile further along Aigburth Road from the Church Road dairy. But, Richard took the property for himself. Fred was dismayed and never forgave his brother-in-law, but nevertheless, went on to do well at Cartmel. The Taylors relocated to Otterspool Farm and returned to a more traditional way of farming - grazing their cattle in fields, but still selling fresh milk locally. The 1938 directory lists, under ‘Farmers’: Taylor, Rd. Otterspool Farm, St Anne’s, Church Lane, Liverpool 17. That year also saw success for Richard in showing his best cows at the Royal Lancashire Agricultural Show, when it was held at Wavertree Playground. He took first prize with a roan in the Dairy & Fat Cow Class: Dairy cow, calved, any weight. His prize money was £5! ​Richard and Jane continued living and farming at Otterspool until they retired, when Edward took over the running of the farm. In the post-war era the dairy business increased by leaps and bounds; as well as the milk the cows produced, Eddie also had access to ‘Railway Milk’. As the name suggests, farmers from areas like North Lancashire and the Lake District were sending their milk down to Liverpool via the railways, where the milk was pasteurised and bottled and then sent out to milk retailers like Eddie. His milk round grew and grew. He sold Farm milk from his own cattle, pasteurised, T.T. (Tuberculin Tested,) and sterilised. Eddie did very well out of it, but he deserved everything he got, as the hours were long and seven days a week, with no sick leave. Richard and Jane moved to Kirkby Lonsdale to enjoy their retirement. Richard passed away in 1961, followed by Jane, in 1963.